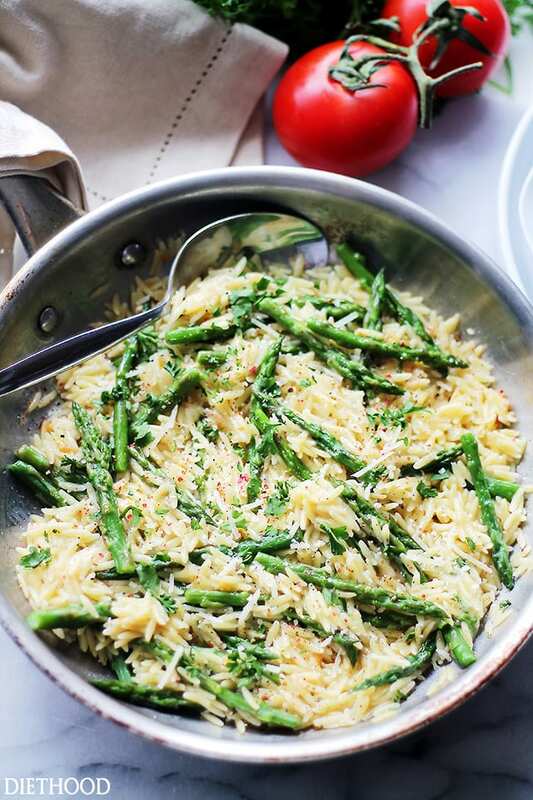 Garlic Butter Asparagus Pasta – Orzo Pasta and fresh Asparagus tossed in a garlic butter sauce and parmesan cheese. It’s a 20-minute, garlicky, cheesy, and amazing side dish! And so it begins! Spring recipes ALL the things! Buuuuut, if I am going to be perfectly honest, this “spring weather” is still beggin’ for Minestrone Soup and Cinnamon Roll Coffee Cake. So, Hellooooh, friends! How are you?? Spring Break is next week for us and we have ZERO plans. Staycationing is the way to go. All the cool kids are doing it! Besides, our planned one-month summer break in Macedonia should make up for it. Can’t WAIT! 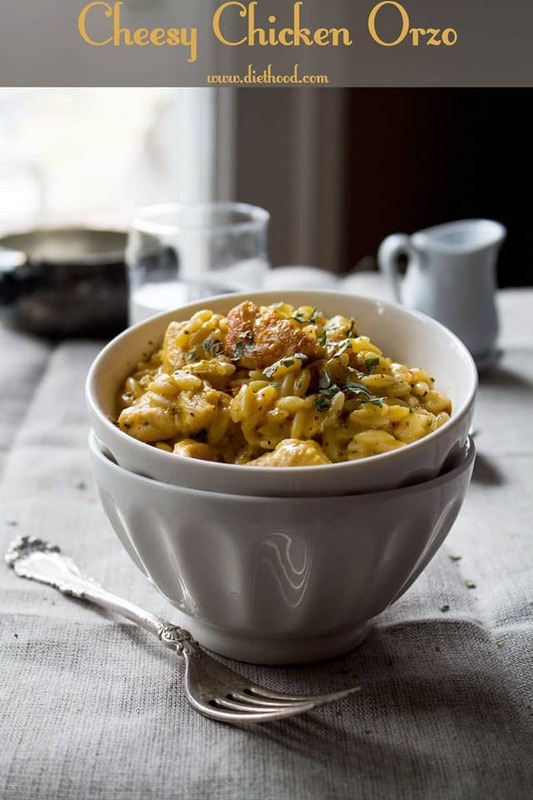 Also in the good-news bucket, THIS creamy orzo pasta recipe with 6 INGREDIENTS + 20 MINUTES = 1-0 for us! Garlic Butter is the sauce of Gods. It has to be. Just look at that layer of golden orzo and beautiful asparagus covered in said buttery amazingness… music to my tummy. This is one of those side dishes that forces me to go back and steal just one more bite (make that TEN) while I’m packing it up to put away in the fridge. Or worse? Packing it up into my husband’s lunch container! That means I’ll never see it again! Or at least not until I make it again… which will be tomorrow. Add butter to a skillet, stir in garlic and cook for 5 minutes. Continue to stir so the garlic doesn’t burn. 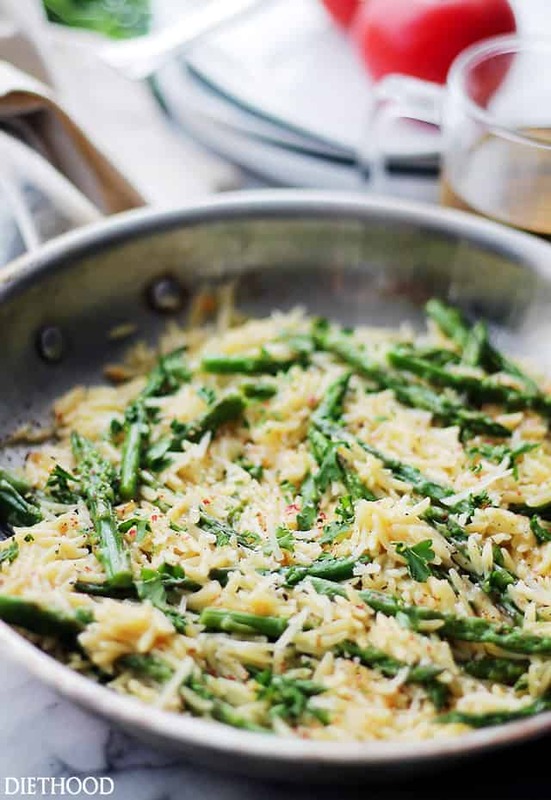 Then, stir in the prepared orzo and asparagus stalks, along with the cheese, milk, parsley, salt and pepper. Cook for 1 minute, garnish with parmesan cheese, and serve. IF your Friday night plans included pizza and a movie, scratch that. No, not the movie! Just the pizza. Trust me, the Garlic Butter Asparagus Pasta comes together WAY quicker than any pizza ever could. EVEN the frozen kind. Yep, faster than delivery, too! Come awn, git ‘er done! Orzo Pasta and fresh Asparagus tossed in a garlic butter sauce and parmesan cheese. It’s a 20-minute, garlicky, cheesy, and amazing side dish! Deeee-licious! Maybe not as easy as I wanted it to be, but it will be when make it again and again. I’ll have everything measured, prepped and ready to go. Just wanted to let you know how yummy I thought it was! I have made this so many times. It’s delicious. Thank you! Mine did not have as much flavor as I expected. I will try again and see if I DoD something wrong…I like the little bit I did have. Yummy!!! And you weren’t lying when you said quick and easy. I’m that person who takes 45 minutes to make mac n cheese. Lol. This took me 5 minutes to prep and another 10 to cook. And it was so good. I paired it with a nice caprese chicken breast but this easily could’ve been a full meal for me. Thanks for this easy, delicious recipe. This is a wonderful, easy side dish. Made tonight and so pleased with the results. Easy, tasty, nice enough to serve as a side at a dinner party. I didn’t have a full pound of asparagus so added frozen peas. Thank you so much for sharing! I really wanted to save this but it looks like the “print” option isn’t working? Hi! I just tried in both chrome and safari, and it worked for me. If you have a minute, could you please let me know what device you’re using and what browser so that I can fix the issue? Thank YOU! Could this be made with wild rice instead and do you think it would freeze well? I made this today…delicious!! The only thing I did differently was roast the asparagus while the orzo was cooking and I was making the sauce. I cut them into three pieces, tossed them with a little olive oil, salt, pepper and Parmesan cheese and put them in a 425 degree oven. After that I folded them in with the orzo and sauce. Yup, I need that garlicky butter sauce in my life right now!! Love easy simple recipe. I love asparagus! Made again! and it was delicious. I make this every so often. This recipe is amazing and delicious. Thanks. Just made this last night. I didn’t have orzo on hand, so I used a little star shaped pasta that I had in the pantry. I also used heavy cream in place of the milk, and used a little of the pasta water to get the right consistency. It was so creamy and delish! I thought I was eating a fancy risotto, only this was much easier. My husband loved it and declared “You can make this every week”! Thanks for such a quick and easy, GREAT recipe! I will be sharing! you dont list calorie content! There are many nutritional calculators online. Thank you this sounds so good, will try it this week and make my hubby some baked chicken to go with it. Hi Juanita! I love this as a side to chicken – I hope you’ll enjoy it, too! Let me know if you have a chance! 😀 Have a great Sunday! This was delicious. I paired with grilled jerk chicken and everyone loved it. Thanks. I have made this numerous times since I found the recipe and we absolutely love it. Thanks for sharing. It’s so simple but so VERY good. Making it again for dinner right now. That is so good to know!! Thank you, Gale!! I truly appreciate it! I made the garlic butter asparagus pasta with non-dairy products (Earth Balance “butter”, Veggie “parmesan cheese” and soy milk) and it was DELICIOUS! I also added 1 lb. chicken that I sauteed in a non-stick skillet for some protein and my whole family (four-year old twins included!) ate it up! Delish!! Just made this for dinner tonight, Katerina! So easy and SO good! This is definitely a keeper for us! Making this again!!!! I pinned it when I first made it. Was looking at my pins for a good side dish for roasted chicken and saw this and was like YES! This was delicious!!! Thank you!! This recipe is amazingly simple and amazingly delicious. Thank you so much! Just love it when someone posts a delish/easy/fun recipe. Even more so because of the fact you embrace everyone’s ‘tweaks’ to your recipe. My tweak would be to use cream instead of skim milk and add some shrimp in there. Can’t help myself, I’ll eat those lovely crustaceans every chance I get. I’m thinking this with a loaf of crusty bread and a tossed green salad w/a vinaigrette would be great for date night. THANKS for such a great recipe. My husband made this for us one night last week. We loved it and gobbled it all. He told his work colleagues about it and now it has spread throughout his company. Everyone who has made it loves it and has made it more than once! So have we! Thanks, Katerina for such an easy and delicious meal. Last night we used the rest of the asparagus from the first try and threw in slices of chicken sausage for a really yum one pot dish! That is all kinds of awesome! THANK YOU SO MUCH!! 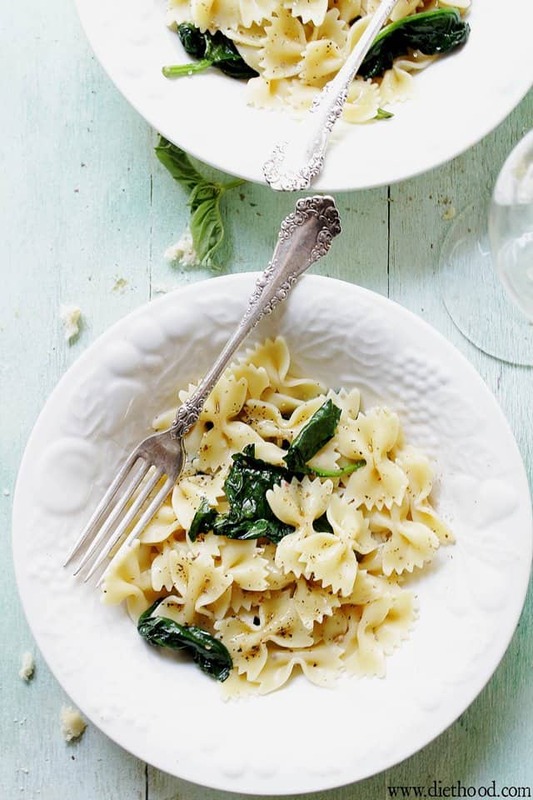 How gorgeous is this spring pasta – perfection! I added grape tomatoes and orange bell peppers to sautee with the garlic. makes it really colorful. I bet that was SO good!! 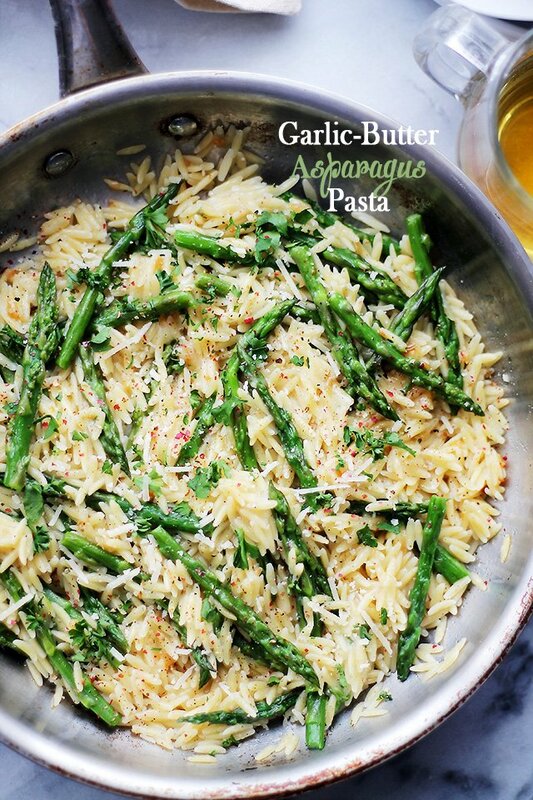 Orzo and asparagus sound like the perfect combination. I’ll be trying this yummy looking recipe soon! consider my pizza dinner plans changed! 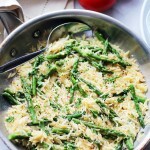 How could I pass up asparagus with orzo and garlic butter – SO good!! Hi! Why do you use only the tips of the asparagus and what do you do with the bottoms? Hi Olivya! The very bottom of the asparagus is stringy, so you don’t want to use that. But, in this particular recipe I only use the tips so you don’t have to cut it while eating. But, if you want to use all of it without the very bottom, the recipe will still taste great, you’ll just have to possibly use a knife to cut it up when eating.